SMOK isn’t as well-known of a brand like Arizer or Aspire, but the company has still proven time and time again that they have quite a bit to offer to the vaping community. The TFV4 Mini is essentially a smaller version of the larger TFV4, but SMOK has improved many aspects of the vape in the smaller version and fixed a lot of the issues that people had with the original TFV4. The TFV4 is part of the ever-popular sub ohm tank category, and it’s a very intriguing offering if you’re in the market for a tank of this nature. The SMOK TFV4 Mini aims to offer a great vaping experience with excellent flavors in a very compact size, and for the most part, SMOK has succeeded with what it set out to accomplish with this particular gadget. To find out whether or not the SMOK TFV4 Mini will made a good addition to your collection, keep reading my complete and in-depth SMOK Mini TFV4 review. To give you a quick idea of what I’ll be talking bout in this SMOK TFV4 Mini tank review, SMOK has made some great improvements as compared to what we previously saw with the company’s TFV4. The TFV4 Mini provides a compact design, excellent vapor and flavor, a sleek look, and a truly excellent section of coil and RBA. If the smaller tank capacity doesn’t bother you, this is definitely a tank that’s worth taking taking a look at. When you compare the TFV4 Mini to the original TFV4, the reduction in overall size that you see really is quite fantastic. The smaller size does a lot for the TFV4 Mini, with one of the most notable things having to do with its looks. The Mini version of the TFV4 is much better-looking than the original TFV4, and the smaller size also brings it down to the 22mm standard diameter size. What’s this mean though? Unlike the original TFV4, the TFV4 Mini should easily fit on any normal box mods, meaning that it’s compatible with a much wider selection of mods than the previous TFV4. One really big strong suite that I noticed right away while starting the review was the great tasting flavor that it’s capable of producing. I’ve tried lots of tanks in the past, and while I’ve had plenty of really positive experiences, it can often be difficult to find a tank that’s capable of creating truly rich and ﻿﻿smooth flav﻿﻿ors that make you want to keep using your vape. Thankfully this isn’t the case at all for the TFV4 Mini, as the flavor and vapor quality that it creates is some of the best you’ll find for a tank in this category. A lot of this is due to the Clapton coils that SMOK decided to integrate into the TFV4 Mini out of the box, and the power of these things really is amazing. The exact Clapton coil being used in the TFV4 Mini is the CLP2, and it creates for extremely large clouds that are both bigger and denser than what you’ll find with something along the lines of a more traditional quad-coil design. Along with being bulky and unsightly, another big issue that faced the SMOK TFV4 was a leaking issue that created for a big loss of e-juice. Thankfully, SMOK appears to have fixed this issue with the TFV4 Mini. I’ve yet to experience any sort of leaking issues while using the tank, and while there’s no way of telling if this will remain the case in the future, I’m hoping that this is so. Unwanted leaks are never something that you want to run into, but so far the TFV4 Mini has been doing really well with holding in e-juice and not letting it leak out. Props, SMOK. The SMOK TFV4 Mini definitely isn’t a cheap tank, but the included accessories that SMOK bundles with it does make up a bit for the increased price tag. Along with the tank itself, you also get the RBA section with the Clapton coils I already talked about, a free screwdriver for working the tank, two additional coils, and small vape bands. 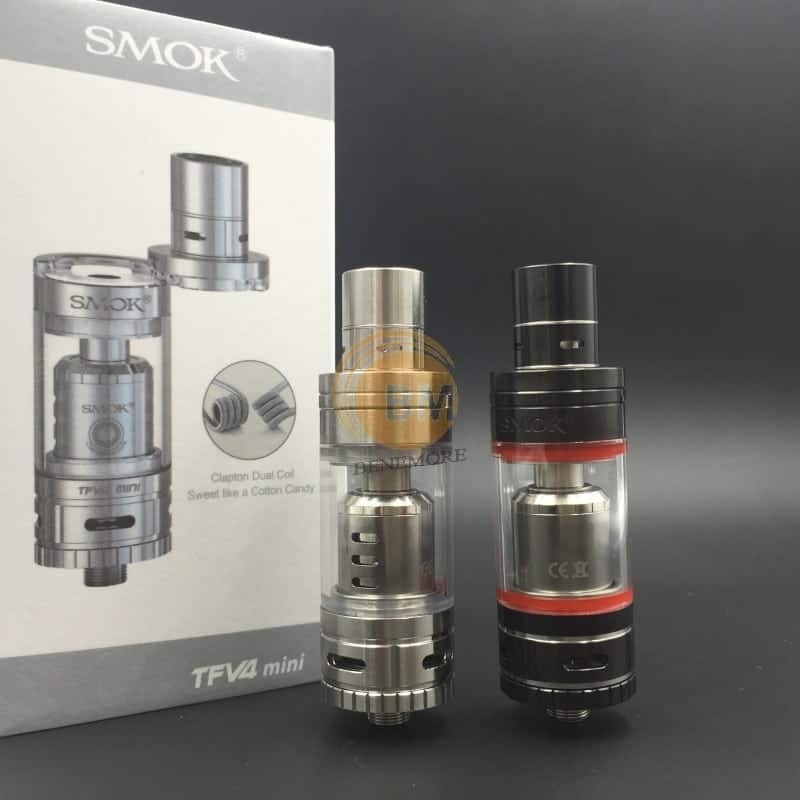 Perhaps one of the weakest aspects for the SMOK TFV4 Mini has to do with its tank size. The smaller size between this and the original TFV4 does do wonders for the tank’s overall design and looks, but it also means that the tank capacity is quite a bit smaller. Just how small are we talking though? Try 3.5ml. That can sometimes be enough to get most people by, but because of the juice-draining coils that are included with the TFV4 Mini, you’re going to be running out of juice faster than you’d initially anticipate. On average, I’d say that the 3.5ml tank on the TFV4 is only good for about 30 to 40 puffs at the very most, and after this you’ll need to refill the tank completely. This can prove to be incredibly annoying, and it really does detract from the portability factor of the Mini if it means you need to always carry around extra juice with you. You can’t talk about this tank without doing a SMOK TFV4 Mini RBA review. SMOK has included an RBA section with the TFV4 Mini, and the section allows you to add incredibly thick wire if you heart so desires. The way the deck is built also means that it should be relatively easy to build on it, and as a whole the RBA area here means that you can get plenty of enjoyment out of the TFV4 Mini without having to spend a ton of money on additional replacement coils for it. To wrap up my SMOK TFV4 Mini review, I have to give SMOK a round of applause for how much they’ve improved on this tank when compared to the original TFV4. The Mini much better-looking, is compatible with a wider range of mods, doesn’t have any leaking issues, and creates for great flavors. The small tank capacity certainly is something to keep in mind, but if that doesn’t scare you off, there’s a lot to like with what SMOK has created here.